The reveal of the Google's new Pixel handset – which is also the first and only Daydream-ready phone that's been announced so far – has finally set the company's real VR plans in motion. With its newest headset, Google Daydream View, it's clear the company is getting serious about virtual reality. Clay Bavor, Google's head of VR, notes that it's far lighter than other devices – specifically 30% – and is able to work with both the 5-inch and 5.5-inch Pixel smartphones. There's also a bevy of other Android handsets on the way that will be able to work with View. At $79, it's still more expensive than Google Cardboard but it's cheaper than the $99 Samsung Gear VR. That's of course not counting the price of the smartphone Daydream View needs to actually run. So how does it actually fare? Well, we've been using the Cardboard sequel for a while now and it's become clear that Google's view of VR is on the right track. There's no doubt that Daydream View is immediately eye-catching. It just looks so damn soft and oddly appealing, like a comfy pair of sweatpants. It's not the nicest sounding comparison, but every time I've mentioned the analogy to someone, their eyes light up in agreement. Simply put, Daydream View's cloth design is inviting and cosy, invoking the same feeling you'd get from lazing about without a care because it hides the tech we've come to associate with hard plastics and metals – and so far, this look is unlike any other VR mobile headset out there. Sure, Oculus Rift is swathed in stretchy cloth materials but with View, there are no wires, it's far smaller and of course, portable. 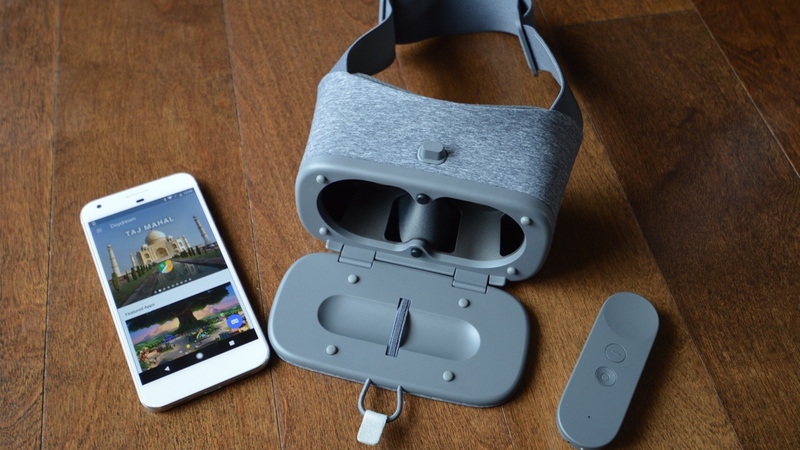 This alone is a combination that would entice anyone interested in trying out VR but coupled with the slate gray cloth (or the "crimson" and "snow" versions coming later), the Daydream View makes an undeniably attractive package. Now, it's not without the hard plastics. The Pixel phone sits right on top of an inner plastic tray that holds it in place. Then there are the glass lenses and, of course, the plastic controller that comes with every headset. There are no buttons and the front closes with an elastic clasp that has a pull tab for easy access. I can see this getting worn down over time with all the stretching, but for now it's stayed sturdy. Audio is solely dependent on the headphones or earbuds that you have on hand – this is one thing Google didn't pack into the box. Whatever device you use should work fine with View: there's a spatial audio engine built into the Google VR SDK (software developer's kit) which according to Google has been "highly optimised for mobile VR." That means if a developer has taken advantage of the engine, there should be good spatial sound to keep you immersed in Daydream's VR experiences. The View has one adjustable band that goes around your head. There's some soft rubber on the inner portion of the strap to help the headset stay in place, but the plastic sliders often loosen during usage causing the headset to slowly slide forward. It was also hard to tighten them back up with the View still on the head, meaning I'd have to take it off, readjust and repeat. This was both a good and bad thing; I usually don't have to readjust headsets because I'm pretty much done with using them after a few hours. With Daydream View, I'd use it for longer periods of time and need to fix the band. So, it's annoying, but it also means the headset is really comfortable and can be worn for longer than just a few hours. What also helps with comfort is the fact that I don't need to take my glasses off. The Gear VR has a diopter allowing me to see, but even then it's still a little blurry. Somehow the Daydream View manages to fit large framed glasses into the viewer while maintaining a really small form factor. Most of the weight sits on the forehead. The face padding is extra squishy as well so you hardly feel the headset. My initial experience had a rather large nose gap similar to the one on the Rift. However during the review process, it was barely there. With next to no light bleed, the experiences were much better and more immersive. I think because my demo was quick and dirty, there was little time to fully adjust the headset properly on my face. At home, I was able to find a good level of comfort without worrying about the next person in line. Using the headset is ridiculously simple. To get Daydream up and running, you just need to place the Pixel into the headset. The tray has little capacitative nubs that help detect where the screen should be centred while an NFC chip (also built into the tray) starts up the app. It's far easier than inserting a Samsung phone into Gear VR, but there have been a few moments where the app didn't start immediately. I'd have to pick the phone up and place it down again for the NFC to register. Regardless, it's a painless process and overall, a quick fix. When I first tried out Daydream View there was a moment of lag, but I haven't seen anything similar since. I also noted that the field of view wasn't great but I've come to realise that it's dependent on the device you're using. Specifically, the 5-inch Pixel versus the 5.5-inch Pixel XL each provided a distinct viewing experience. The smaller Pixel presents noticeable black bars on the outer portion of the screen, whereas on the XL, it's practically invisible. The AMOLED screens themselves are fantastic and absolutely brilliant in terms of clarity, colour spectrum and vividness. The viewing angle specs haven't been released by Google just yet while the refresh rate and screen specs depend on the phone. For Pixel, you're looking at 1080 x 1920 pixels (441ppi) and while the XL is 1440 x 2560 pixels (534ppi). The difference in screen sizes means that smaller handsets won't look as good using Daydream View since the FOV is bound to shrink, which is something to keep in mind if you plan on using a Daydream-ready phone that's less than 5.5-inch in size. For those on iOS devices, it's unlikely Google will pull a Cardboard again and let iPhones get in on the Daydream fun. It makes sense considering the platform is heavily geared towards Android, but like the Gear VR, this means it's losing out on a hefty portion of people who want a good mobile VR headset. The Daydream View controller is larger than a Rift remote and smaller than a Wiimote, which makes sense since it can fit inside the View headset when you're done using it. This makes it as portable and easy to use as the View headset. It also means you don't have to hold your hand up to your head for controls, or buy an additional third-party device. The View controller fits comfortably in my small palm and is so light I'm not surprised Bavor dropped it during the Pixel announcement. The controller is also pretty durable, as I've dropped it several times myself and haven't seen a single scratch, dent or malfunction after picking it up. There are only five buttons including a trackpad that doubles as a button. Below the trackpad, you'll find an app button, which can show menus, pause, go back or change modes depending on the app itself. Then there's the home button below, which returns you to the Daydream View's home screen or re-centres your view. Lastly, you can find the volume up and down buttons on the right side of the controller. There's also a USB-C port on the very bottom – which conveniently is the same as the Pixel's charger – to juice up the device. Google says it has a 12-hour battery life and so far that matches up with my experience. A status light towards the bottom of the controller flashes three times after pressing the home button lets you know if it needs recharging. For the most part, the tracking has also been surprisingly good. Various games involve aiming with it or using it to move around, and so far the controller has successfully accomplished these actions. The only thing that's been annoying is the constant re-centreing. Just like the major headsets where you can re-centre the view, Daydream View lets you re-centre the controller and headset. There were moments in-game or in the menu where the controller's dot would wander off with a mind of its own. I expected to re-centre the controller a few times after using an app or moving around physically, but on more than one occasion it would randomly drift and end up pointing in another direction (this was also long before I dropped the controller). The Daydream View home looks a lot like Oculus Home, which you may have seen on Gear VR or Oculus Rift. That's not a bad thing, especially since the interface is intuitive and familiar. A simple swipe or a tap on an arrow with the controller's trackpad lets you navigate the library and Google Play Store menus swiftly. From the Play Store, you can download and install apps and games immediately. There are 25 games and apps to try right now, and like all the other platforms there will be plenty more very soon. Like Sony with PlayStation VR, Google is promising 50 experiences by the end of the year. I was able to try a decent amount on Daydream View and on the whole, came away impressed. The usual Google repertoire is always fun to use in VR, with YouTube, Google Street View, Play Movies, Photos and Arts & Culture being the ones available. With the exception of Play Movies, the apps have all been used on Cardboard before so they're not exactly earth-shattering options. However Google has revamped YouTube a bit and made it much more VR friendly. You get to watch all your favorite 360-degree channels along with non-VR in 2D videos. There's even a Google Assistant voice search if you want to go hands free. On the game side of things, I was able to try Hunter's Gate, Claro, Wonderglade and VR Karts (among others) all of which provided a well rounded experience that showcased just how much Daydream View can do. Hunter's Gate is a dungeon crawler that has you playing one of two characters who automatically shoots at the demons you're aiming at. This game was able to show off the controller's ability to aim as well as move the character around with the trackpad. It takes a minute to adjust and then it's a breeze. You can change the aiming mechanism to use your head as well, which has been a staple for many VR shooters. Claro is a lovely puzzler that isn't too difficult and lets you relax a bit while moving the sun around with the controller in order to help a tree grow. Wonderglade has four carnival-esque mini games that again use the controller's aim along with its internal sensors. VR Karts does the same thing and has you turn the controller so you're using both hands. From there, you're able to test out your racing abilities by tilting the controller to hug the turns. Not including download times for games and updates for the various apps, and the Pixel itself, I was able to get around four hours of usage from Daydream View. If sitting by an outlet or using a portable charger, you can even keep the Pixel handset battery going since the charge port remains open and easily accessible. Google Daydream View is a dream come true for mobile VR. It’s comfortable, lightweight and attractively designed which is half the battle won in the world of virtual reality. The other half is price which Daydream View also succeeds at by keeping costs relatively low. However the lack of iOS compatibility, a few design flaws with View’s strap and the controller’s wandering pointer keep it from receiving a perfect score. Nonetheless, Daydream View is still one of the best, if not the best, mobile VR headsets you can try right now.